In order to broadcast your live stream into a Vidyard player, you need to obtain streaming credentials from within the Vidyard platform. To do this, create a live streaming player in the dashboard. From that player, you can access a streaming key and the URL for the stream ingestion endpoint. Choose a start date and time. Important: The start date and time will add a countdown to your player which will display until the determined time for the stream. This start time will not actually start your stream. Note: The time zone for the start time is set to the time zone on your computer. Optionally, add an email address. This will send stream credentials to the given email address. Stream credentials will always be available from within the Vidyard platform. Note: Consider creating a distribution list for stakeholders in your live stream. This will ensure that everyone involved will receive access to these credentials. Optionally, also choose to optimize your stream for less viewer buffering or less video delay (recommended). Note: Optimizing for less video delay will result in shorter video packets being delivered to the browser. If you have the Backup Ingestion option, toggle the switch to ON to receive credentials for a backup stream. You may choose to add additional pre-recorded videos to your live stream before or after your broadcast by uploading new content, or selecting from your video library. Note: videos or future livestream recordings added to the player will appear in a playlist ordered from newest to oldest. In this way, viewers of the livestream player experience your most recent content first. By default, the streaming credentials will be emailed to the email address associated with the Vidyard user account of the player creator unless an alternate email was provided in the request. You can also obtain the streaming credentials from the Livestream dashboard, within the player settings screen. In the Player Dashboard, hover over the player which contains your live stream and click Settings. In Settings, click the Live Stream tab. Here you will see your Live Stream Credentials and your Optimization options. Note: If you requested credentials for a backup stream, your Backup URL and Backup Key will be found here as well. Adding the streaming credentials to your broadcast software will vary by platform. For instructions on how to complete this, refer to the documentation for which broadcast software you have chosen to use. If you are setting up a backup stream, enter your backup credentials at the same time. You can add either a pre-roll or a post-roll event to your Vidyard Live player. Learn about adding events to your players. At any time before your broadcast, you may insert a pre-roll event. 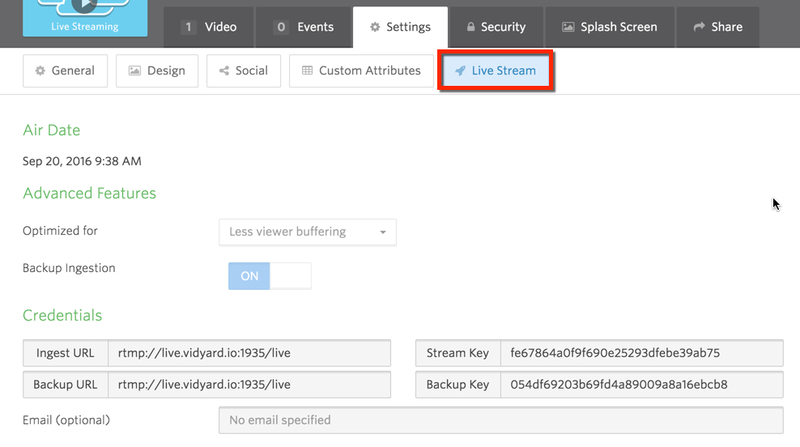 Vidyard Events allow you to specify a fixed message or gating form in front of the live stream. This allows you to share additional details or resources with your viewers before they begin the stream, or request data about your viewer by form fill. After your stream has ended, the stream video will be turned into an on-demand asset that is available in your Vidyard account. You can add further pre- or post-roll events to that player. You can also add a post-roll event if you have a pre-recorded video set to run after your live stream. Similar to a pre-roll event, you can add a message, links to additional resources, or a data capture form. The stream itself is managed through the broadcasting software. Consult your software documentation for steps to start, manage, and stop your stream. You can manage and track your stream from the Vidyard Live dashboard. With channel-style streaming you have the option to start and stop your stream multiple times, or to run just one stream, then end the session. This allows you to end a particular streaming session, then send the newly streamed video to an on-demand video asset in the Live player. A new 'offline' video stream will then be added to the player, waiting for a future stream date. You can then use your streaming credentials for this player for future streams from any location. This means you can end an individual streaming session, then start another session using the same credentials as many times as you wish. End the stream from your broadcast software. Click End Stream in the Vidyard Live dashboard. Closing the channel will expire the streaming credentials for a player. No further streams can then be made to that player. The player will then be immediately transformed into a fully on-demand video asset in your Live player. The player embed code does not change, so any players you have embedded will still be available at their embed locations. Note: Viewers will instantly see your on-demand video assets. If you want to secure a player, you can do so in a player's security settings. In the Vidyard Live Dashboard click End Stream (to end your current stream), then click Close Channel. 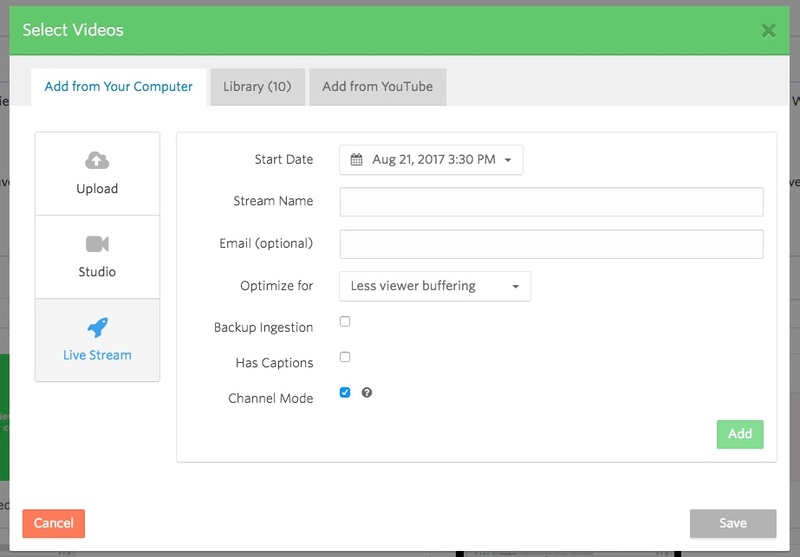 Remember: After you close a channel, you will no longer be able to create new Live streams in this player and your stream or streams will become an on-demand asset within this Vidyard player. This can not be undone.